Hamo had already walked 17 kilometers (10 miles) that day, pushing his 8-year-old daughter, Sidra, in her wheelchair, when he stopped in a field to ask directions to the Idomeni refugee camp. Offered help to push the wheelchair, Hamo declined, adding, "I only want to go to Germany." The 36-year-old Iraqi, who is traveling with his wife, his disabled daughter and two more children, is one of the thousands heading northward through Greece, even though they know when they reach the border with Macedonia, it will almost certainly be shut. The fields of Idomeni were never a proper border crossing between Greece and Macedonia. It's where the freight trains cross, and earlier in the crisis refugees and migrants traveling clandestinely through the Balkans used it as they followed the tracks — on foot — north toward central Europe. Soon it became a major staging point in the biggest mass movement of people the continent has seen since vast displaced populations were being repatriated after World War II. For many months, after Macedonia allowed the organized flow north by train, hundreds of thousands used it. Then Macedonia built a double fence protected by coils of razor wire and last month the flows slowed to a trickle. But people kept coming, hoping against hope to get through. This month, the gates closed, leaving about 14,000 refugees and migrants stuck on the Greek side, in an area that heavy rains quickly turned into a quagmire. At the tent city that has sprung up as more and more refugees become backed up there, refugees protest near the border fence, crying "open the border" or calling on German Chancellor Angela Merkel to help them. At the height of the protests, children have been forced to run to avoid tear gas fired by Macedonian police. Migrants arrive at Idomeni exhausted after the long trek on foot, and queue for hours to receive food. They sleep in flimsy tents or in the open. They wait near the border gate, hoping they will be lucky enough to be selected for admission. One Syrian woman was desperately looking for someone to give her clothes or food. Every person only has one thing in mind: when will the borders open? 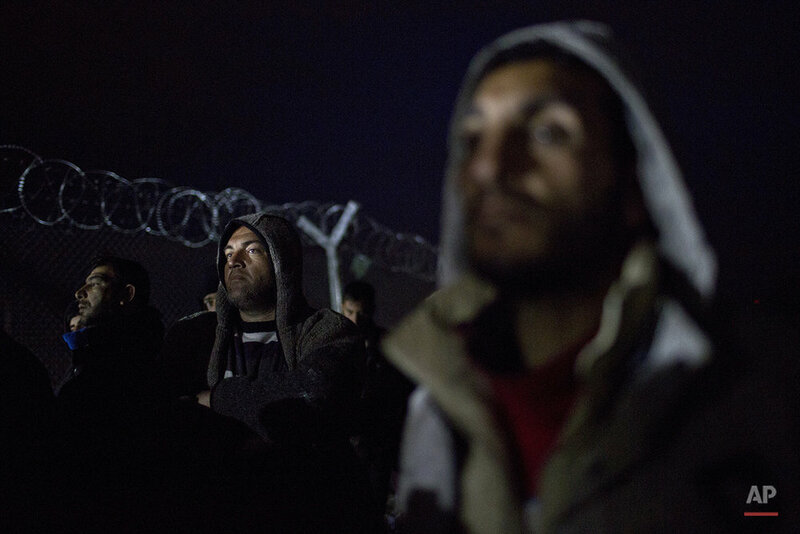 Text from the AP news story, AP Photos: Migrants continue to gather at closed border, by Petros Giannakouris.